The migrant entrepreneurship agenda in Italy has a more local dimension while some initiatives are the result of combined actions at several levels of government. In this area, measures are generally rooted in departmental policies and target both the (aspiring) entrepreneurs and the general system, focussing on the removal of barriers hindering a stronger migrant entrepreneurship growth. As of today, one enterprise out of ten is managed by a migrant entrepreneur. In the last ten years, Italy has registered an impressive growth rate of +54% in the number of entrepreneurs with a migrant background. The sectors mostly involved in the boom are commerce, restauration and building as well as, more recently, cleaning, gardening and sewing. Nevertheless, gaps still exist and are mainly related to the lack of specialised supporting services. The main actors nowadays leading the agenda at central level in the country are the Ministry of Interior and the Ministry of Economy. Among the non-institutional actors, the key players are category associations such as UnionCamere, Confcommercio and the Craft Associations Confartigianato (CNA). The three national trade unions (CGIL, CISL, UIL) are also involved in the agenda-setting process along with public and private employment agencies and migrant associations. The objective of the national coalition building process in Italy, led by Formaper, is to promote migrant entrepreneurship transversally by bringing together all relevant stakeholders encompassing the social, economic, and employers’ organisations. 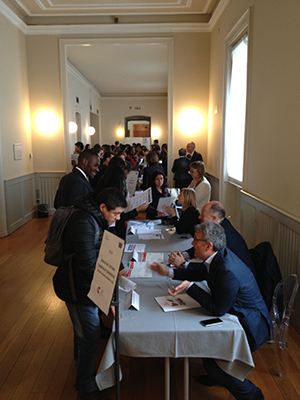 The National Fair on migrant entrepreneurship took place in Milan on 15th May 2018 and was particularly successful in terms of participation and outreach. More than 100 participants attended the event: 35 organisations/associations and 20 companies were represented, more than 20 would‐be entrepreneurs and 20 nationalities, including 2 General Consulates’ Representatives (Uruguay and Bolivia) contributed to the activity. The Programme was conceived on three different phases whose main objectives were the following: Panel debate – to disseminate data and elements defining the reality of migrant entrepreneurship; Desk: to get acquainted with services offered by the organisations and associations and mutually share experience; Working groups: roundtables to let needs of would‐be entrepreneurs emerge, with special focus on access to credit.